HAMBURG, NEW YORK – The Erie County Fair has chosen a fun, creative word to describe the “Best 12 Days of Summer” in Western New York. 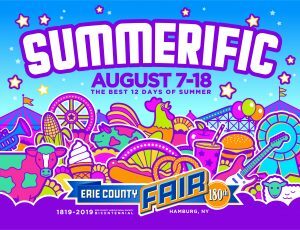 “Summerific” has been announced as part of the launch of the Fair’s 2019 branding initiative. The 2019 campaign will embody the dynamic, textured, fun-filled atmosphere that is uniquely the Erie County Fair. The illustration style combines happy, brightly colored objects, shapes and typography. The design bubbles over with joy and anticipation. The experience is colorful, connected and one-of-a-kind. An experience so big, so amazing, so incredibly fun, that it’s – Summerific! To further describe Summerific, it’s twelve jammed-packed days where you find everything you love about summer in one fantastic place. It’s Summerific. It’s the Erie County Fair. The Erie County Fair partnered with Buffalo’s Wynne Creative Group, a nationally recognized marketing and branding firm, to develop the 2019 branding campaign. Wynne Creative Group has served the Erie County Fair since 2003. Wynne Creative Group specializes in design, brand development and advertising. In 2018, Erie County Fair was recognized internationally with the “Best Overall Marketing Campaign in North America” award by the International Association of Fairs and Expositions.